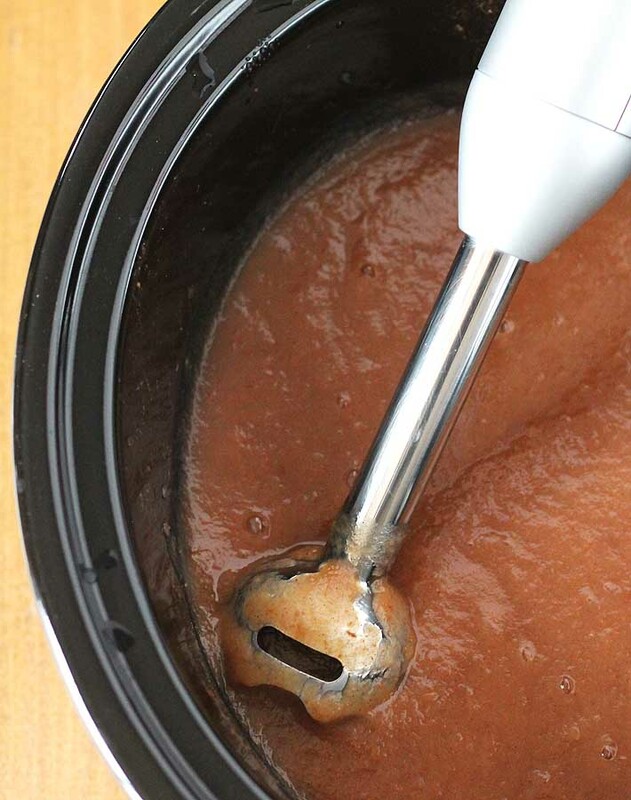 Do you know how to make homemade slow cooker applesauce? I didn’t until a few years ago and ever since that time, I’ve been making it quite often, especially during the fall when apples are everywhere. 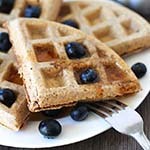 I add applesauce to some of the recipes I make (like my apple cinnamon waffles, carrot coconut muffins, cake doughnut mini muffins, and morning glory muffins!) so I can go through a lot of it, which makes homemade applesauce a money saver. I used to buy store applesauce for my kids to have as school and at home snacks, but after making it at home for the first time, they declared that slow cooker applesauce is so much better than the the kind we bought at the stores and that this is their favourite. I agree. So, now I find myself making this stuff…a lot! 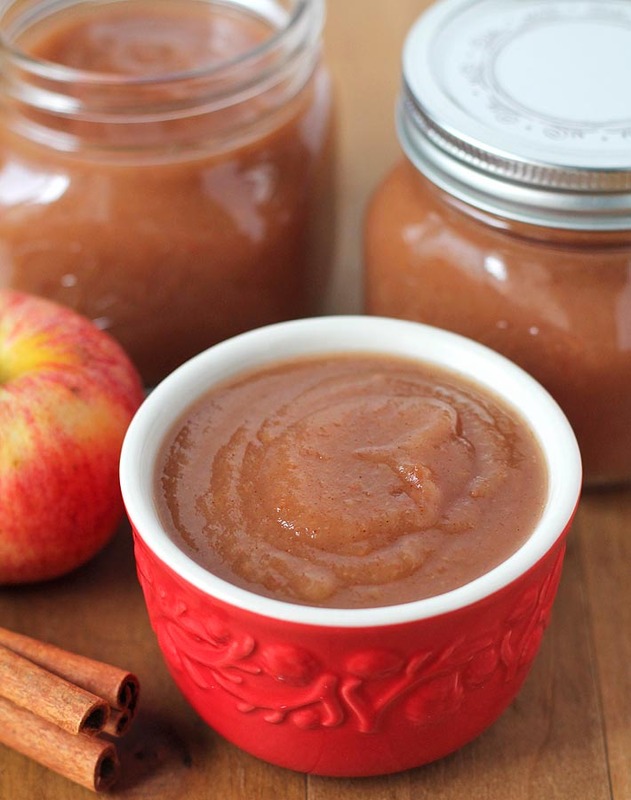 One of the best things about making your own applesauce is that it’s so easy. All you need is four simple ingredients, a slow cooker, and a blender. And there’s no apple peeling involved! Once the apples cook down, the skins get very soft and after you puree into applesauce, you’d never know that they weren’t peeled! Another good thing about making your own applesauce is that you control the flavour, so if you want to experiment with different spices, other than cinnamon, try it! Cut the apples, throw in the spices, add a splash of lemon juice, let it cook for a few hours, puree when done, and you’re set with school snacks for the week or for your next baking adventure. What is the best type of apple to make applesauce? 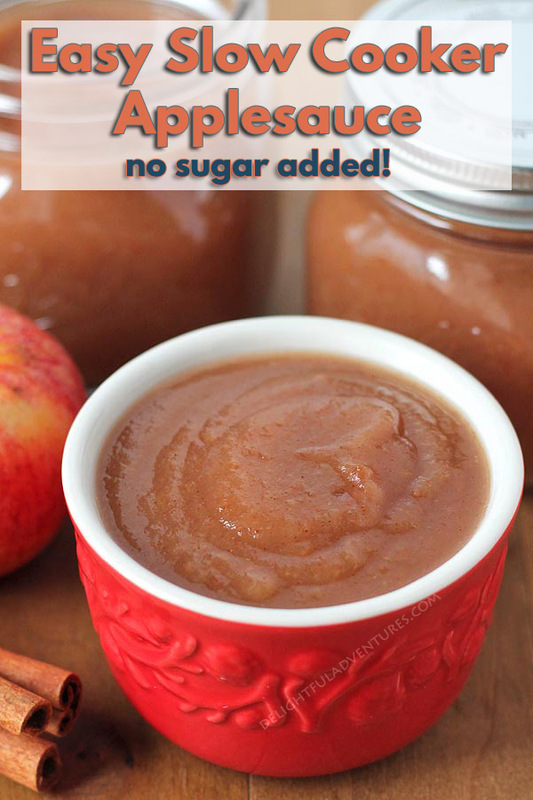 Sweet, softer apples make the best applesauce because they’re naturally sweet and require no added sugar. I always use Gala apples when making applesauce, but feel free to experiment to figure out what type of apples you like best for your applesauce. Whether you are making a spiced version for snacking on or a plain batch for baking (or snacking on, too! ), you can store it in airtight jars or containers in the fridge. Your applesauce will keep for about 7-10 days in the fridge. If I know I won’t be using my entire batch any time soon (either the spiced or plain versions), I freeze it. To do that, I use airtight containers and leave a little space at the top when filling. If you don’t have airtight containers, freezer bags can also be used. Frozen applesauce will keep in the freezer for up to a year (I’ve never kept it in there that long, though!) When I’m ready to use it, I thaw overnight in the refrigerator. To keep up to date on all of my new recipes, please sign up for my newsletter and if you make this recipe, let me know by leaving a comment below or share a pic on Instagram and tag me! 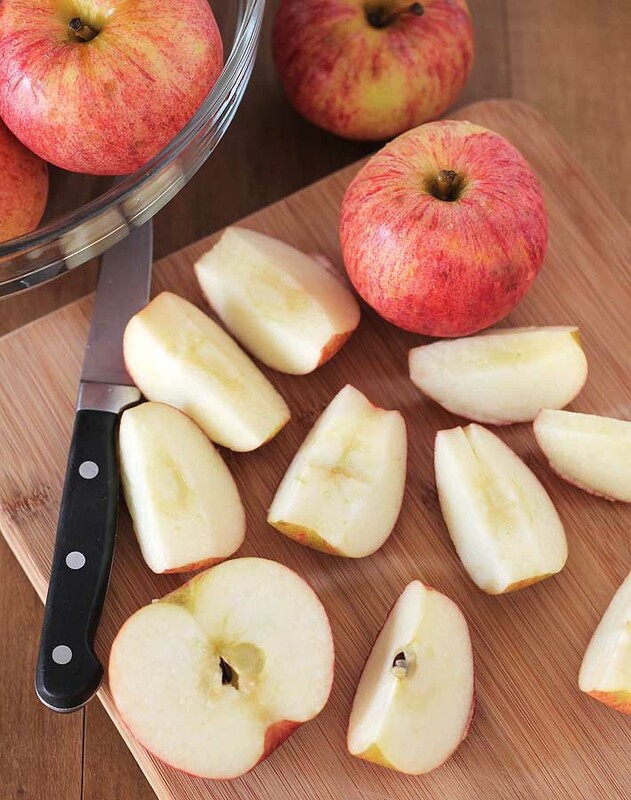 Slice apples into eighths, place into slow cooker. Pour lemon juice over apples. 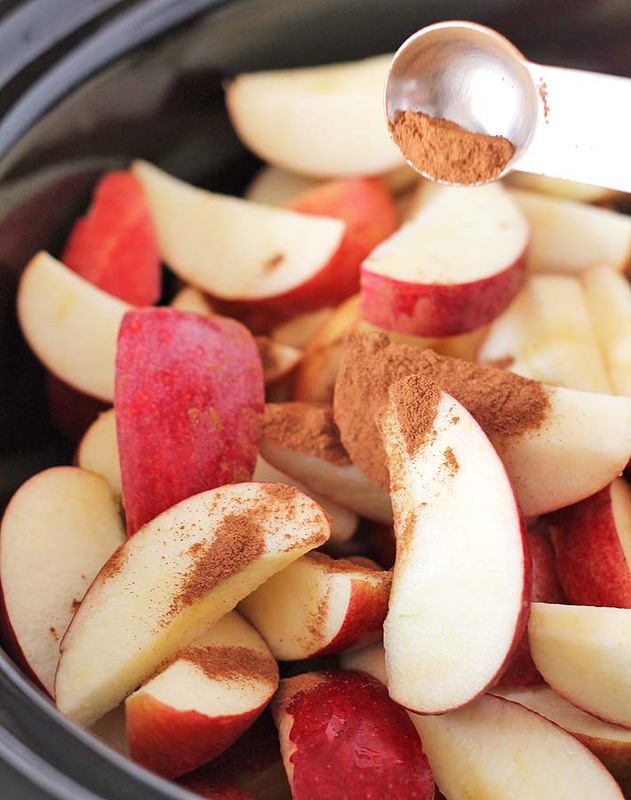 Sprinkle cinnamon and nutmeg (if using) over apples. Carefully mix, so spices coat the apples. Cook for 8 hours on low or 3.5 - 4 hours on high. 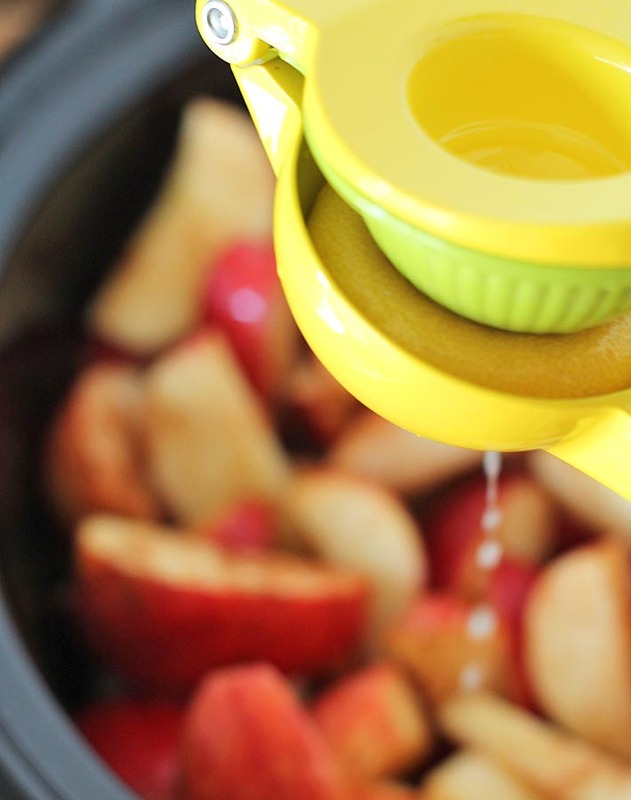 When done, using an immersion blender, carefully puree the apples. Cool thoroughly and then portion out into containers. Refrigerate until ready to use. 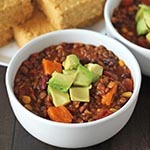 Be sure to read the FAQ (best apples to use, storing, freezing) above before making this recipe. Feel free to reduce the amount of cinnamon in the recipe to 1/2 tsp, or to suit your tastes. In this recipe, I use 1 tsp. Your applesauce will be lighter in colour if you use less. If you prefer plain applesauce, omit the spices. I always buy whole nutmeg and grate it fresh for my recipes, as needed. You'll get the best flavour if you do it this way. If you are using the optional nutmeg in this recipe, click here to see how easy it is to do. Nutrition info is for the recipe prepared as written. Data is to only be used as a rough guide, click to learn how nutrition info is determined on this website. 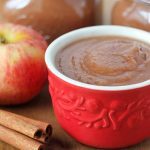 This Slow Cooker Applesauce recipe was originally published December 28, 2014, images were updated September 2017. South Africans are not much for apples, myself included, and I’ve never seen gala apples in our stores before, neither do they sell applesauce. Can I use Granny Smiths (green apples) instead? I’d like to try it as an egg replacer. 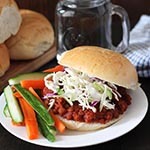 I just bought a slow cooker and this was the first recipe I made in it! I never realized how easy applesauce was to make. I also added a little cardomom and it was very good. My daughter has been bringing it for a school snack all week. Thank you for this recipe! Glad you like the recipe, Sarah! My youngest has been asking me to make this so I’m going to pick up a bag of apples soon to make them for school snacks, too 🙂 Thanks for your note! I don’t have an immersion blender. Could I spoon the warm apples in a regular blender? Hi Kristy, a blender or even a food processor would work fine too. Just be careful doing it, I’d let the apples cool a bit before blending and when blending, vent the lid so any steam can escape. Do the peels become a part of the applesauce? Thanks! Hi Kim! Yes, they sure do. If you take a look at the pics of the finished applesauce, you will see some very small darker spots, that is how the peel blends into the sauce for me (I use an immersion blender but if you use something more powerful, I am sure the peels will blend even finer). The peels really soften up after being in the slow cooker all that time. If you prefer, you can definitely peel the apples before cooking them, that would work perfectly fine too. If you do peel them, I’d add an extra apple to make up for what is being taken away. Hope you like it! What a gorgeous colour you ended up with. It looks rich and delicious. Also, you’re using one of my favourite brands of spices. It’s so delicious, Teresa. And yes, I love this brand of spices! I pick some up each time I make it out to Ten Thousand Villages here in Ottawa. So good! Love this recipe and how easy it is. 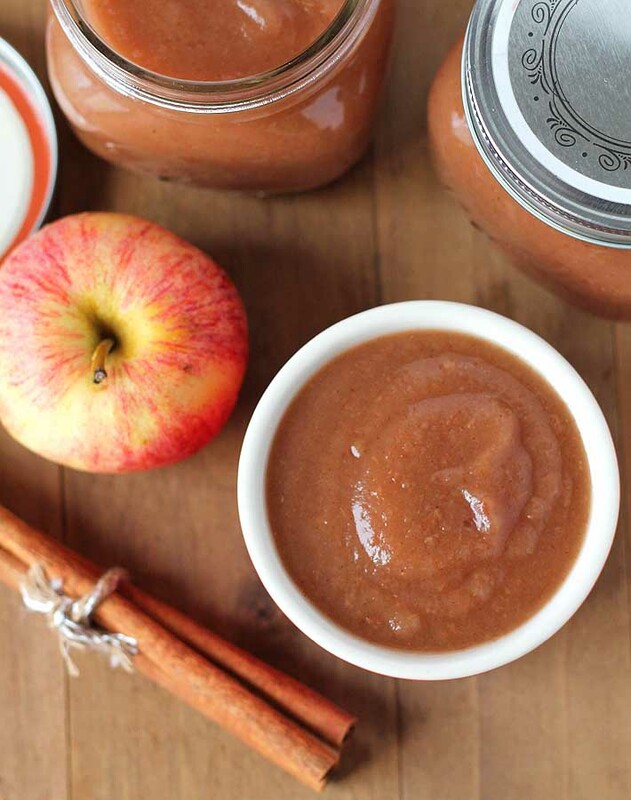 We love homemade apple sauce and will definitely give this version a try. It’s so easy! The first time I made it, I wondered why I had spent so many years buying it at the store. If you try, I hope you love it too, Emily.